Is a surgery in your pet's future? If it is, you probably have a few questions about pre- and post-surgery care. Paying close attention to care recommendations will help you ensure that the surgery is just a minor disruption to your pet's normal routine. Your pet will need to stop eating prior to surgery. If your dog or cat eats prior to surgery then vomits, stomach contents can travel to the lungs and cause infections, pneumonia or respiratory distress syndrome. The exact time your pet must stop eating will vary depending on when the surgery is scheduled. In most cases, your furry friend can still drink water. Some pets will need to eat light meals the morning of surgery. If your pet has diabetes, your veterinarian may recommend a small amount of food to prevent blood sugar fluctuations. Young animals may also need to eat small meals before surgery. Do not feed your pet unless you are specifically asked to do so. The morning of surgery is not the ideal time to try to locate a missing leash or carrier. Your morning will be less hectic if you find these items the day before surgery. If you have a cat that turns into the Tasmanian devil at the sight of the carrier, allow a little extra time in the morning for cat wrangling. Ask your veterinarian if you should bring your pet's medications and a small supply of food with you. Although the hospital can provide food, introducing new food can cause an upset stomach. Your pet needs a comfortable place to recover from the surgery and the effects of the anesthesia. Bring your companion's pet bed or crate to the first floor of your home if it is not already there. If you have small children, you may want to find a quiet room for your pet to ensure that he or she gets plenty of rest. Although your pet may be a little groggy, a little thing like surgery probably will not keep him or her from trying to resume a normal routine. Keep your pet away from stairs or other obstacles until the anesthesia wears off and try to discourage running or jumping. If your pet absolutely must rest, a crate is a good solution, although your furry friend may not be happy about being confined. Pets often receive fluids before, during or after surgery, which causes frequent urination in the first few hours that they are home. Take your dog outside frequently and make sure that a litter box is easily accessible for your cat. If your pet came home with antibiotics or other medications, make sure you follow dosage instructions and schedules to ensure that your pet has an uncomplicated recovery. A positive surgical experience for your pet is our goal. 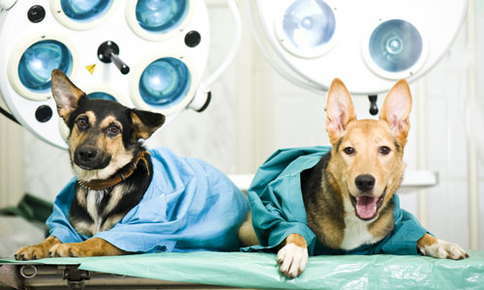 Be sure to contact us if you have any questions about your pet's surgery or need answers to general health questions.